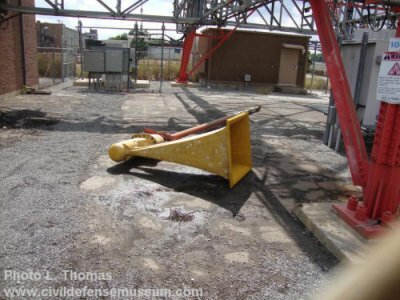 Here are some photos I have taken over the years of some Allerting Communicators of America, later, American Signal Corp. sirens and some photos from other sources. 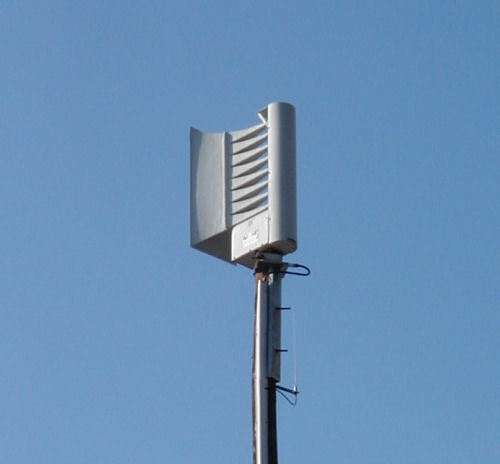 The Alerting Communicators of America (ACA) Allertor 125 was probably the most common ACA siren in the Dallas/Fort Worth, Texas area. 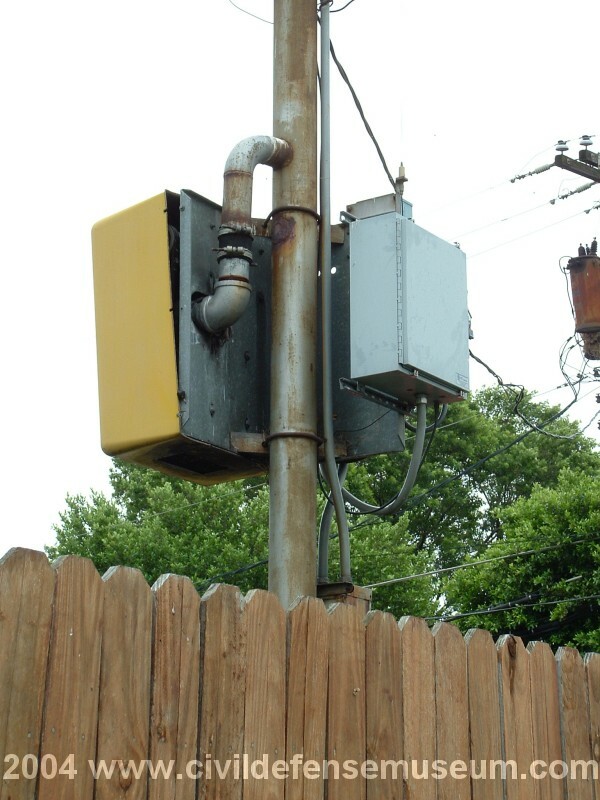 This Allertor is still in place in Richardson Texas as of late 2014. 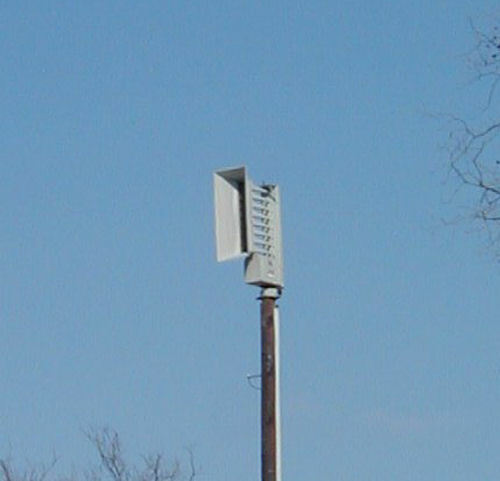 It has been disconnected since Richardson put up a new system of American Signal sirens in 2002. 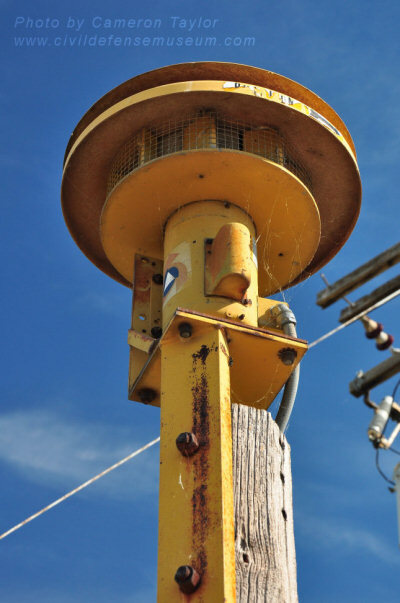 Richardson had 2 Allertors as a part of their siren system that they installed in the late 1970s. The City of Arlington Texas had a system of Allertors that was replaced a few years ago as well. I first saw an Allertor in Arlington Texas back in 1980 or 1981. 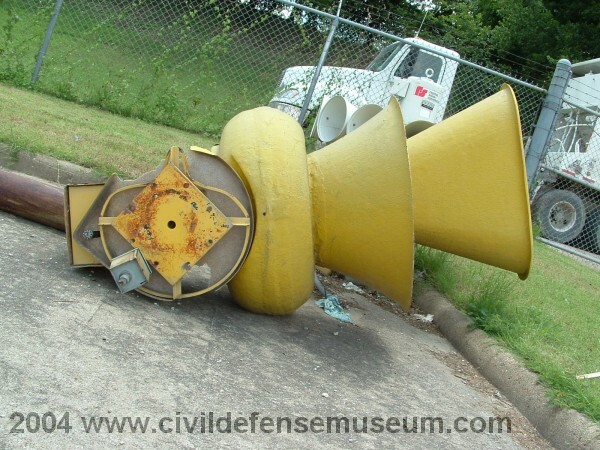 Since I grew up surrounded by Federal Thunderbolts in Dallas I didn't know what the heck the thing was the first time I saw one. 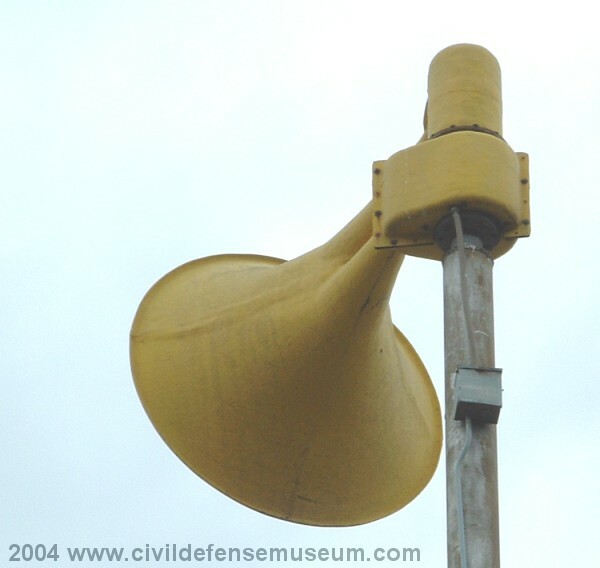 It was definitely the "funkiest" siren I had ever seen at the time. 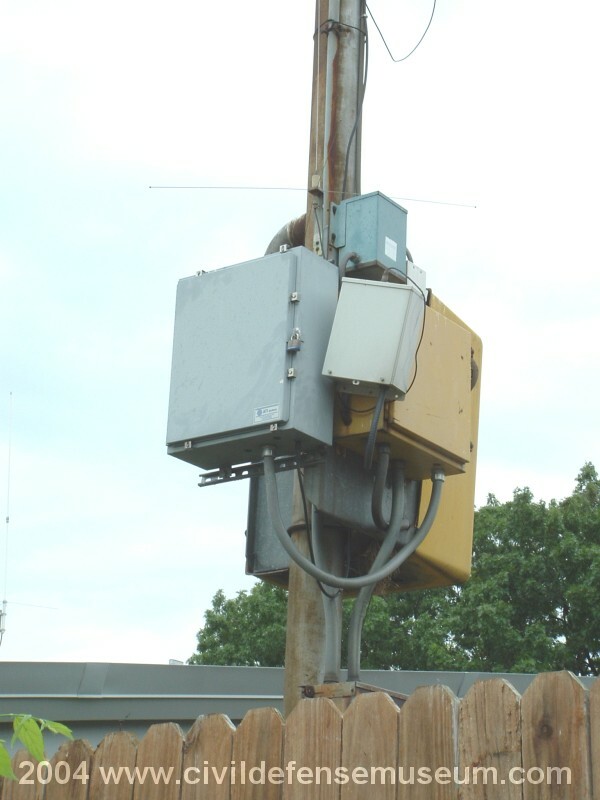 Around the same time period Garland Texas installed a system of ACA Hurricanes (see below) with a few ACA Penetrators. I remember taking a drive out to Arlington sometime in 1980 or 81 to hear one of the newly installed Allertors on a test day. I took a cassette recorder along that day to record the test. About a year ago I found the almost 30 year old tape of that test. It's rough but has held up fairly well over the years. 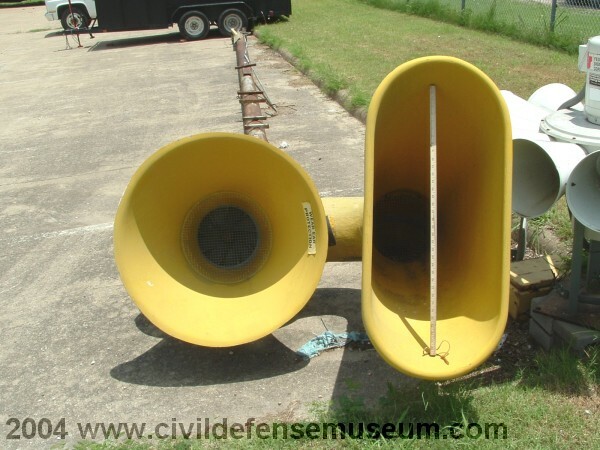 Here's an mp3 sound file of that very Arlington Texas siren test from so long ago. Click on the thumbnails to see close-up photos of the Richardson Tx. Allertor 125. Here are some close-up photos of the other Richardson Allertor that had already been removed. 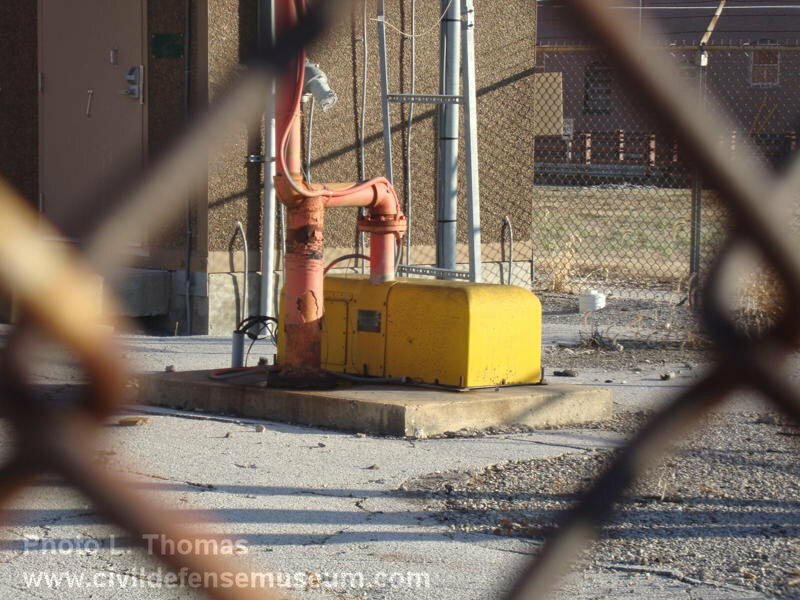 This siren was sitting at the Richardson Fire Training Facility for six years before it was sold at auction. 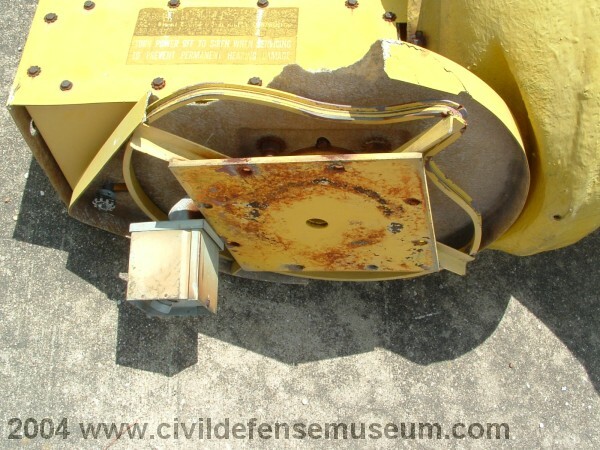 It was in good condition except for the rotator mechanism (center top photo) which was damaged when the siren was removed. 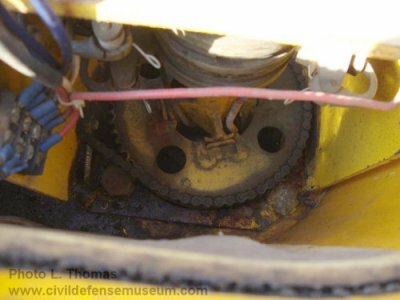 The Allertor uses a chain driven rotator that operates from a gear reduction drive coming off of the back of the siren motor. That's a yard stick in the top horn in the left top photo. ACA used fiberglass extensively in their sirens resulting in their unique appearance. The things really hold up well over the years. 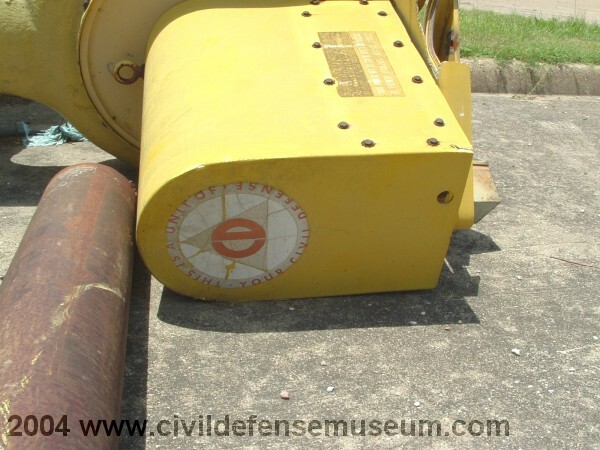 The old Civil Defense decal is still in fairly good shape too! Click on any thumbnail to see the larger photo. 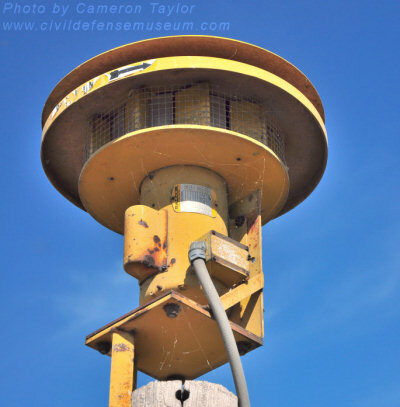 The city of Garland Texas installed a system of ACA sirens in the very late 1970s-1980ish. Like I mentioned above with the Allertor, I didn't know what the heck I was looking at the first time I saw a ACA Hurricane. 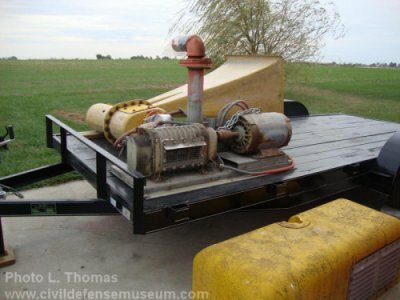 I immediately noticed the similarity of design to the Federal Thunderbolt siren with Hurricane also using a blower with a rotating horn. Actually I didn't know that these were called Hurricanes until about 3 years ago. 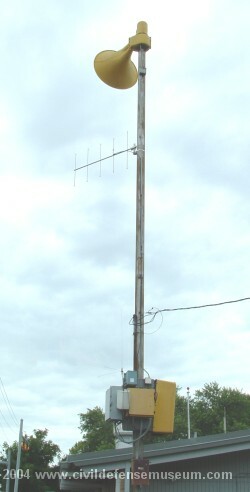 This siren was located at Garland fire station number 3 at the intersection of Jupiter and Bobbie. 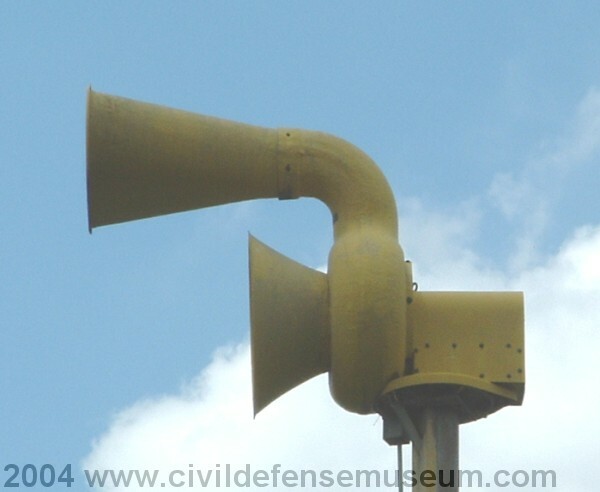 The Hurricane is a bit louder than the Federal Thunderbolt in that it's rated output is 130db at 100 feet where the Thunderbolt is 127db at 100 feet. 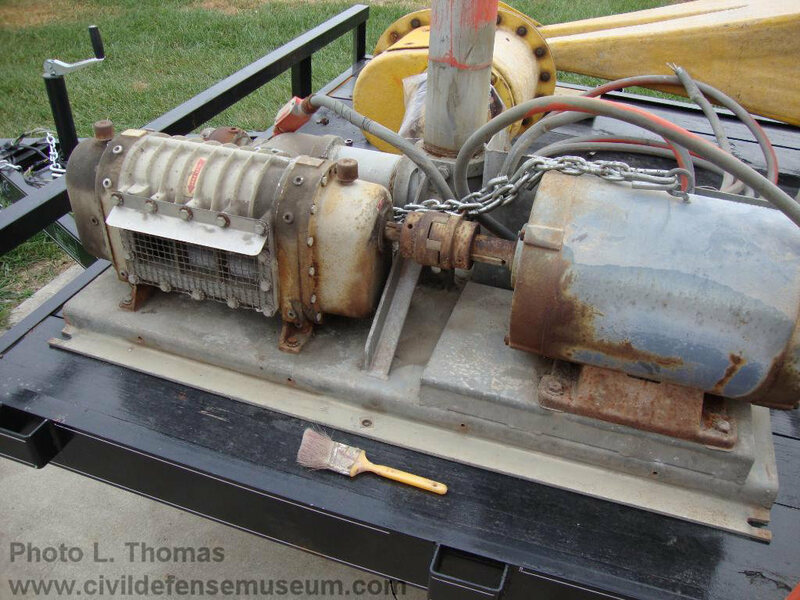 The Hurricane uses a 30 horsepower blower motor as opposed to the Thunderbolt's 7.5 horsepower blower motor. 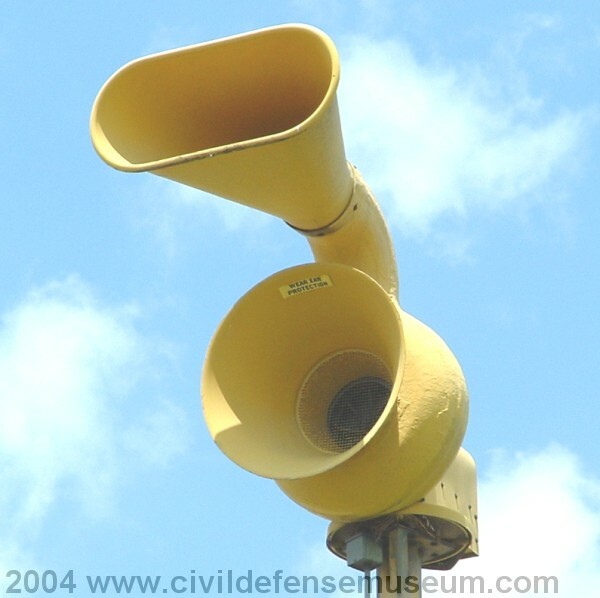 I had never heard a Hurricane siren until I recorded this siren in 2002. 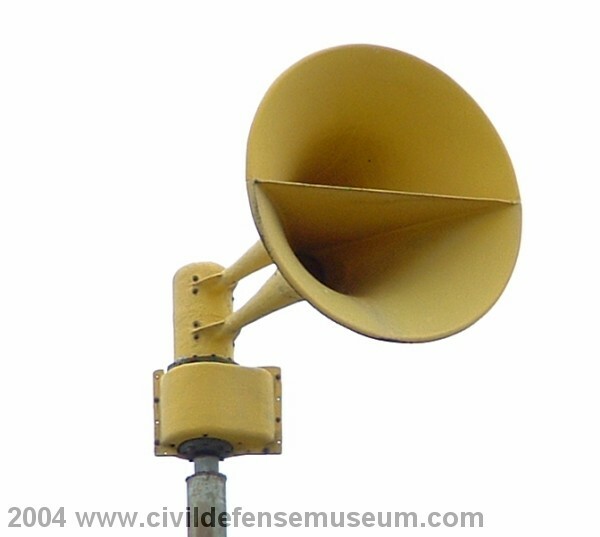 See the Warning Sirens main page for the recording. 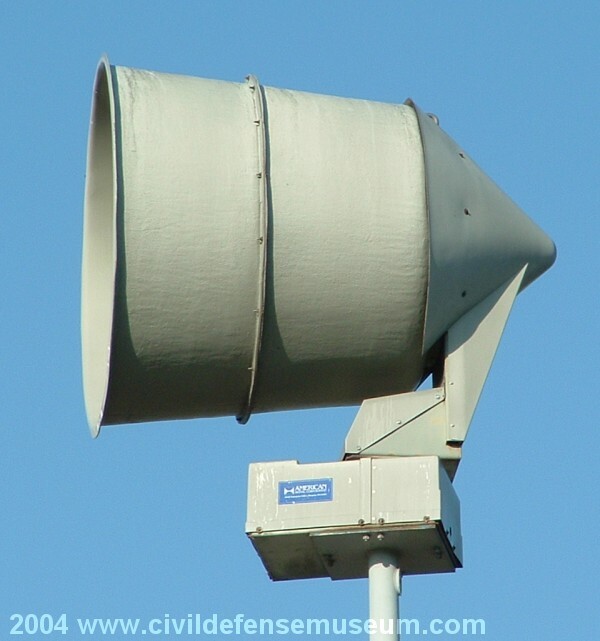 Garland removed all their Hurricanes and replaced them with electronic sirens. Hurricane 130 Mk II Close-up Detail Photos. I took these photos with my Fuji digital camera and the horn/rotator photos turned out far better than I thought they would. 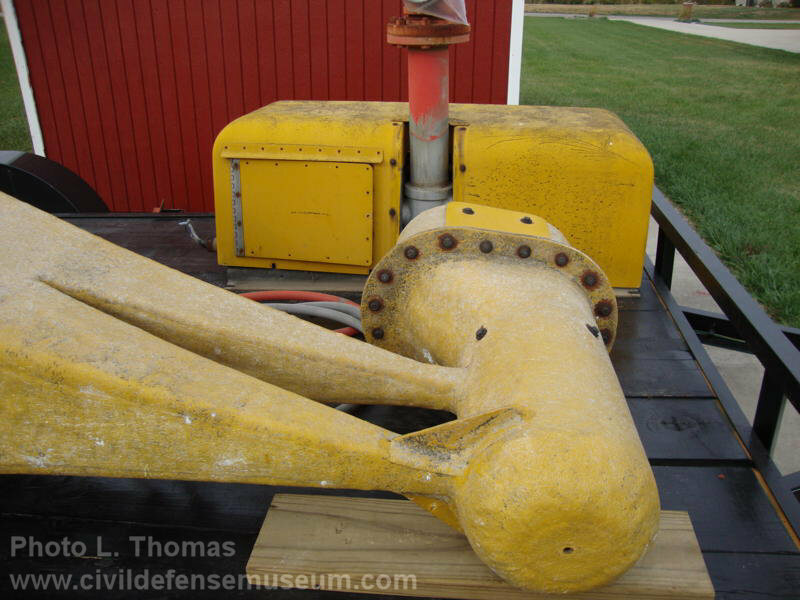 The Hurricane MkII uses a small little rotator assembly enclosed in a fiberglass 2-part shell. 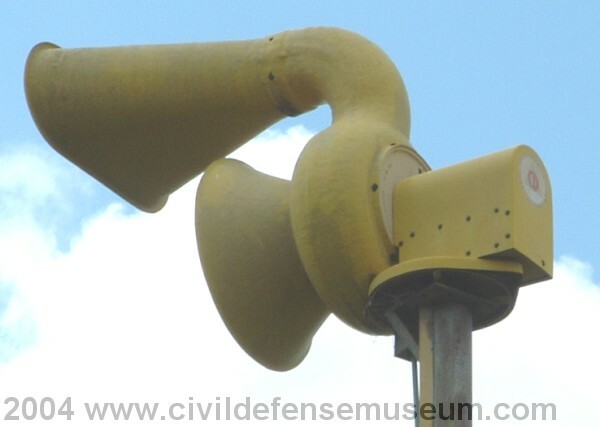 Unlike the first version of the Hurricane siren, the Hurricane 130, the MK II rotator is attached to the pole and isn't enclosed in as part of the horn/chopper assembly. The rotator has a small motor on the side that drives the horn rotation with a chain. The horn turns at 2.5 rpm and the rotation speed is not adjustable. The Hurricane MK II uses a vertical compact little blower unit as compared to the Federal Thunderbolt's larger horizontal mounted blower unit. 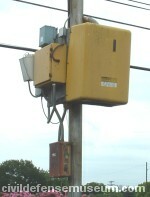 The blower is the larger yellow box on the pole. 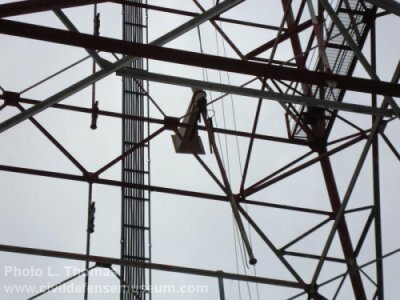 (Bottom left and center photos) You can see the 3 inch blower air pipe coming out of the back of the blower and going into the pole in the lower left photo. 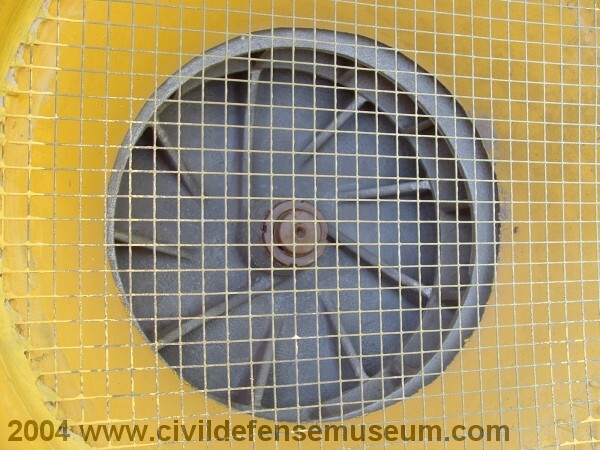 The blower cover is fiberglass too. 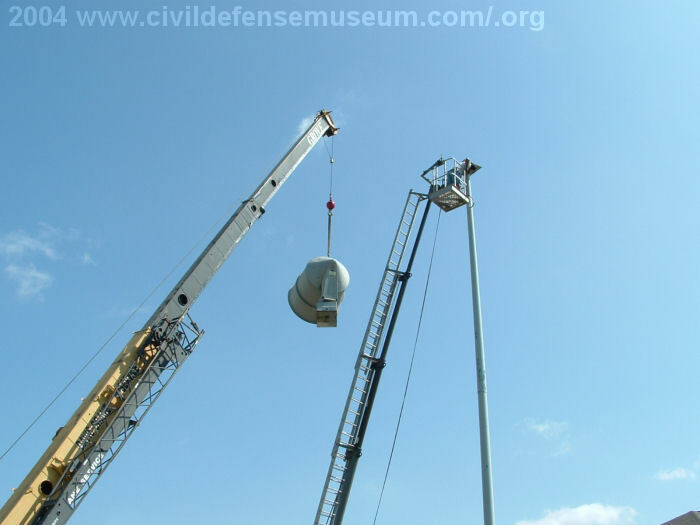 All the Garland Hurricane installations were like this one in the photos. The number of boxes on the pole that accumulated over the years is pretty amazing. 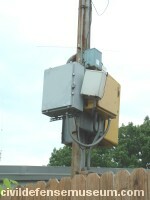 One of the boxes is even tied on with wire. I can't remember what the original installation looked like 30+ years ago but the original ACA control box is the other yellow box on the plate next to the blower. Civil Defense Museum photo contributor Cameron Taylor got these great photos of an old ACA Screamer located at the Lake Benbrook Dam near Fort Worth Tx. This Screamer is a single phase model because of the start capacitor bulge on the side on the siren motor. Cameron's photos are so sharp that the part of the motor data plate can be read in the full size photos. These photos have been reduced in size. I believe the Screamer is a 2Hp motor siren. This one still has a fairly intact original ACA swirling red arrow CD Emblem on the side. Took these pics in Denison, Texas back in 2002. I didn't even know what type of siren I was taking pictures of at the time. 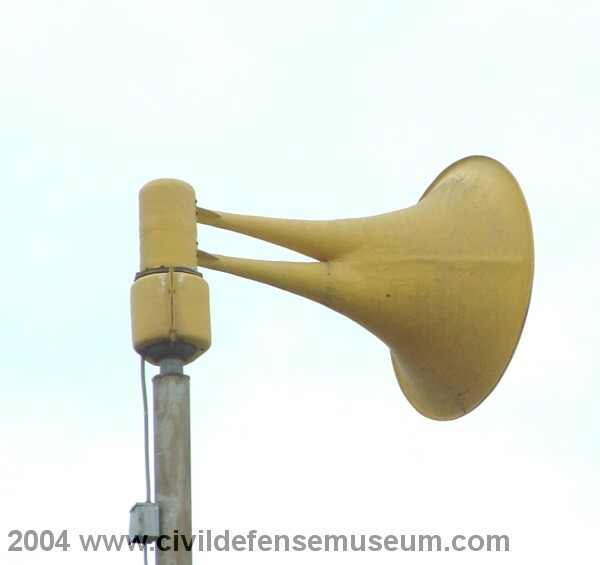 I found out later this is and ACA Alertronic siren. I believe the model number is RE-1600 and is possibly 1980s vintage. 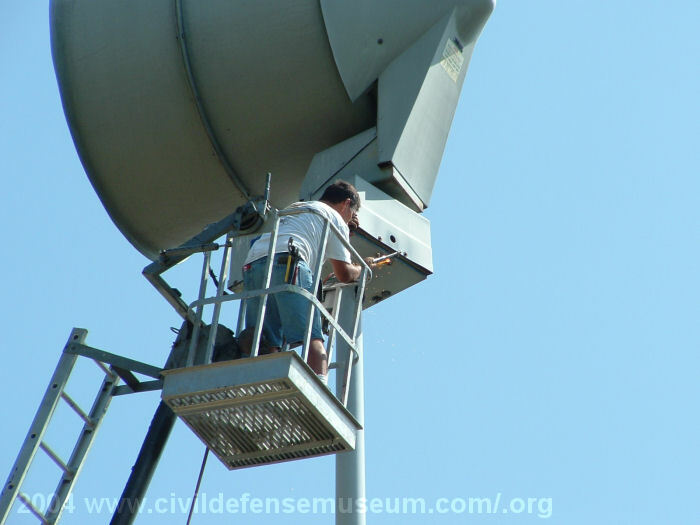 In October of 2010 an Illinois warning siren enthusiast obtained what most likely is the only remaining ACA (Alerting Communicators of America) Hurricane 130 siren. 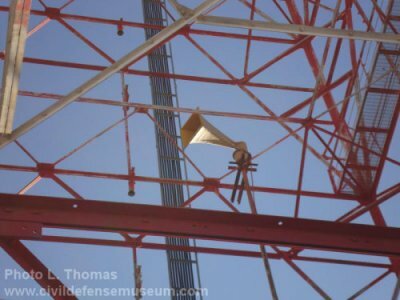 This siren was located on a radio tower in Centralia Illinois. 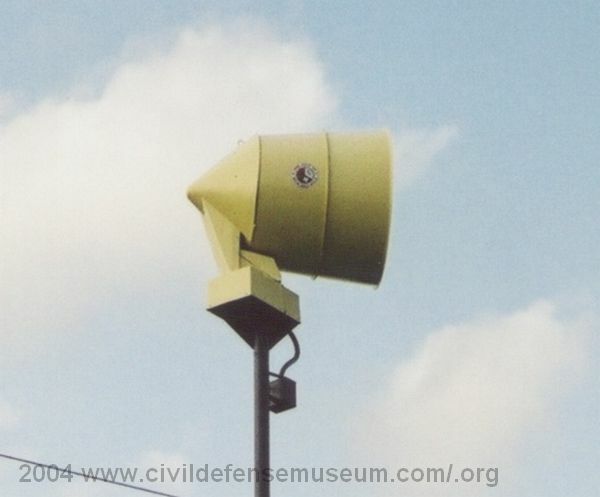 The Hurricane 130 was the first version of the ACA Hurricane siren which ACA later changed to the Hurricane MKII. A MKII Hurricane can be seen on this page on this site. 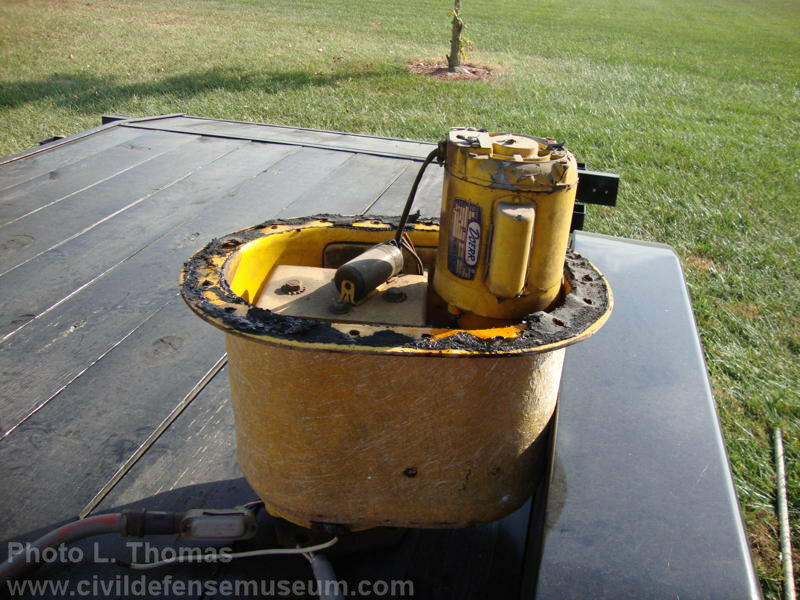 The Hurricane 130 has a 2 hp dual rotor siren chopper motor mounted inside the can-like assembly where the siren horn attaches. 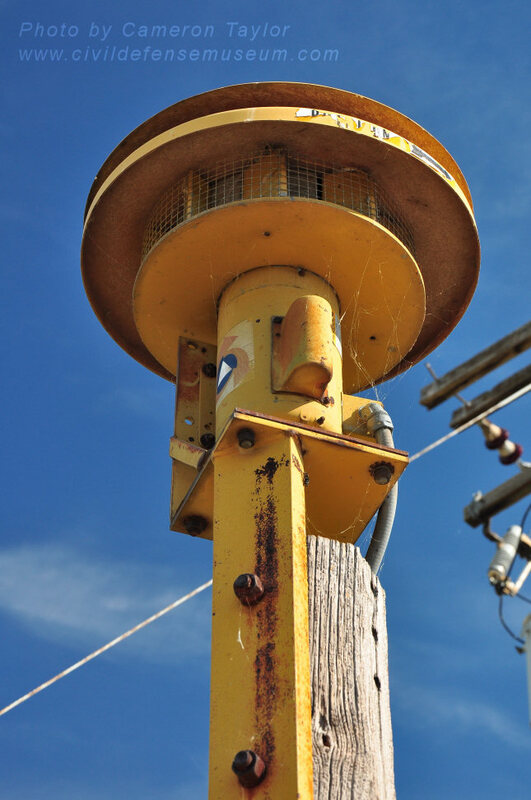 The siren chopper port ratio on this siren is 10/8 which means that one siren rotor has 10 ports and the other rotor has 8 ports. 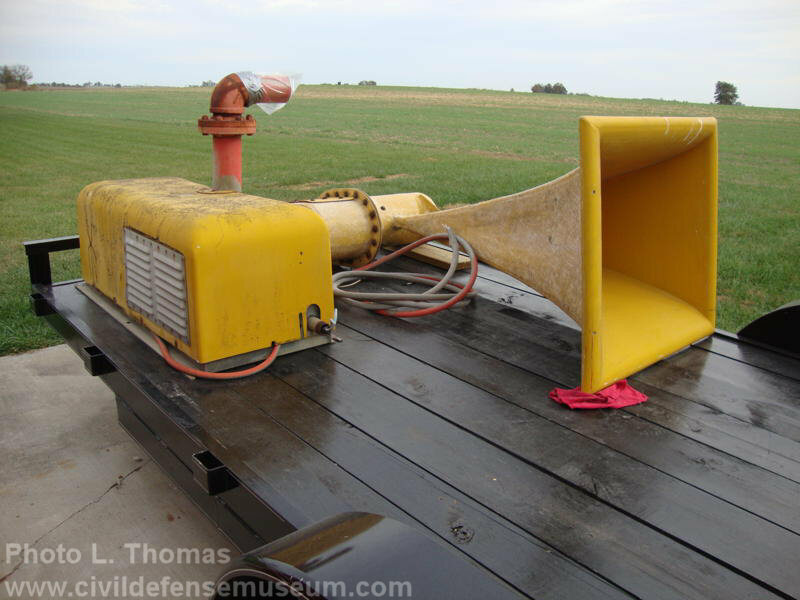 The horn is rotated by a 1/4Hp single phase motor. 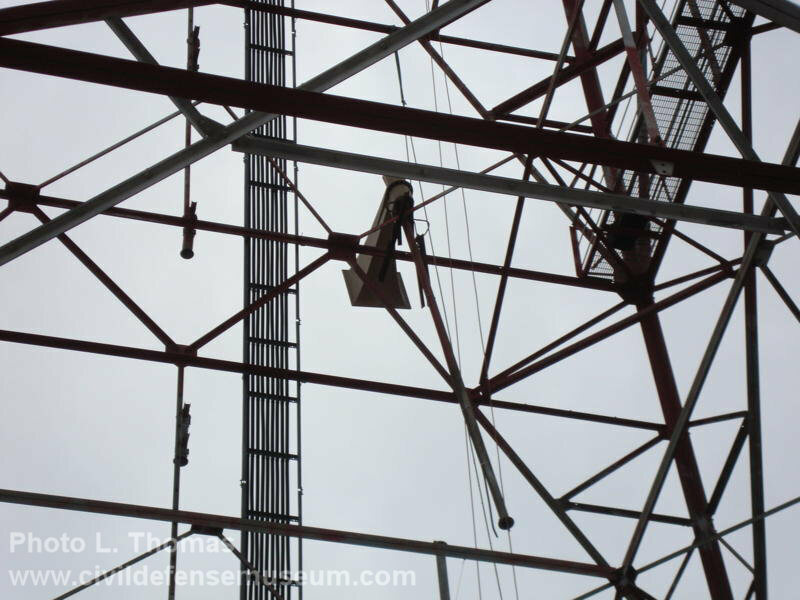 The horn/rotator/chopper mechanism rotates all as one unit with the rotator motor enclosed inside at the base of the unit. The ground mounted blower, which is a 25Hp direct drive roots blower, pumps a pressurized high volume of air up through the siren chopper which results in a very high sound output. Here are several photos that the current owner of the siren sent to me. Click on photos to see larger. 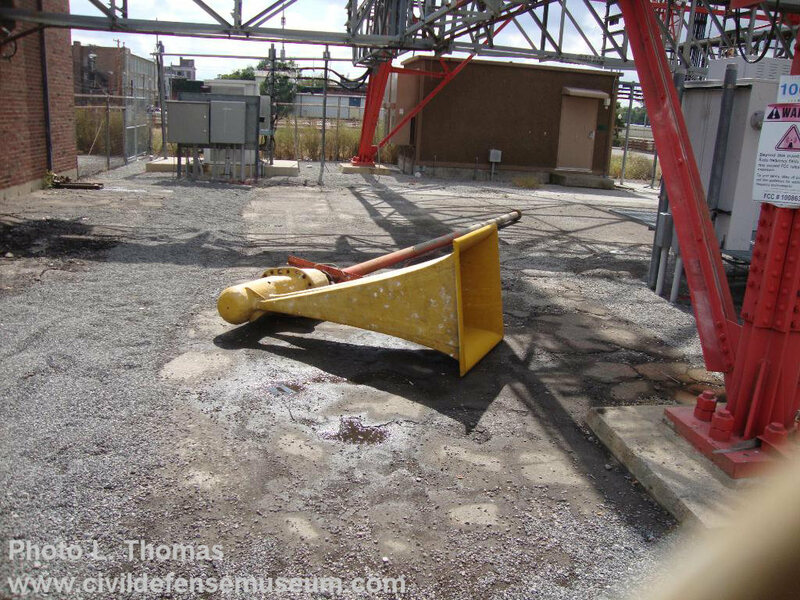 Here are some photos of the two American Signal Corp. T-135s that were removed from Allen Texas in 2004. 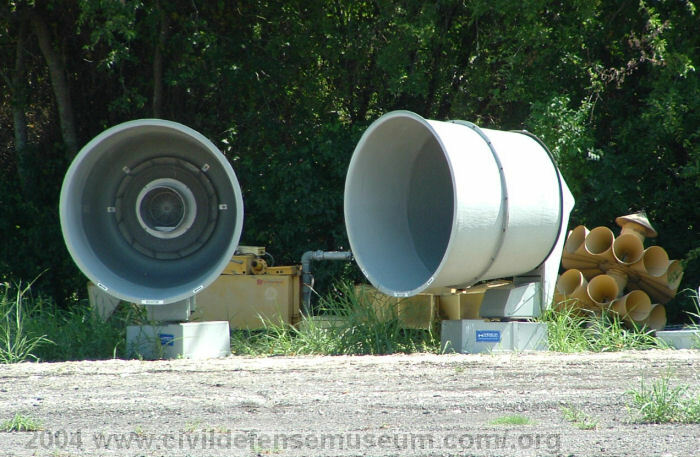 These sirens were installed, I belive, in the mid-1990s. The bottom photo shows the two T-135s on the ground in front of the the other sirens that were removed at the same time. 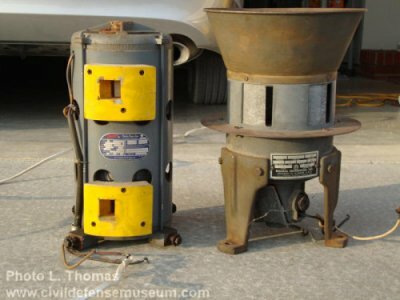 The Federal 2T22 is plainly visible at the right in the photo just behind the T-135. 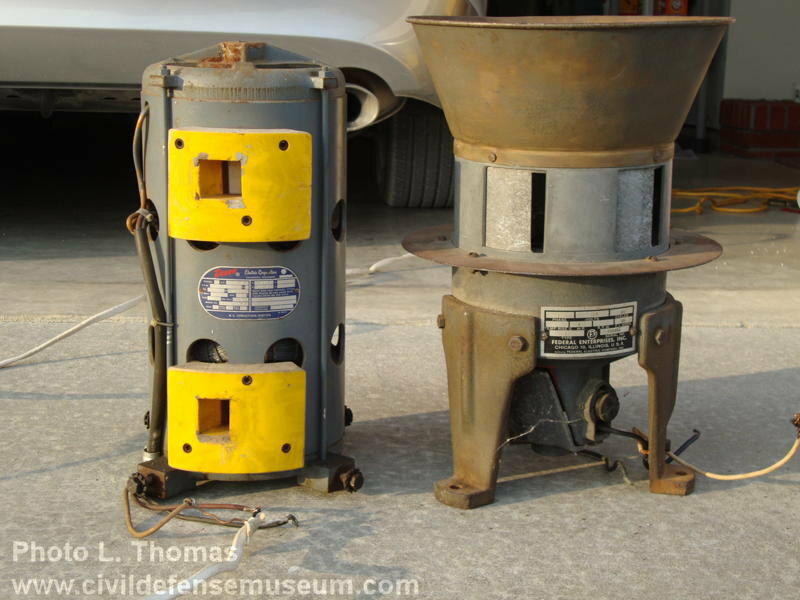 A Thunderbolt blower is just behind the left T-135. 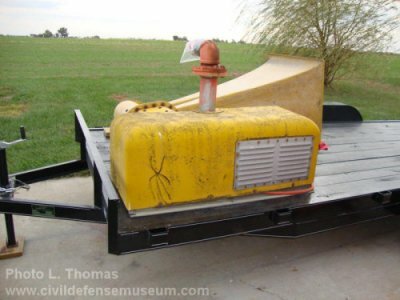 The T-135 was originally called the P-50 due to it's 50 horsepower motor. 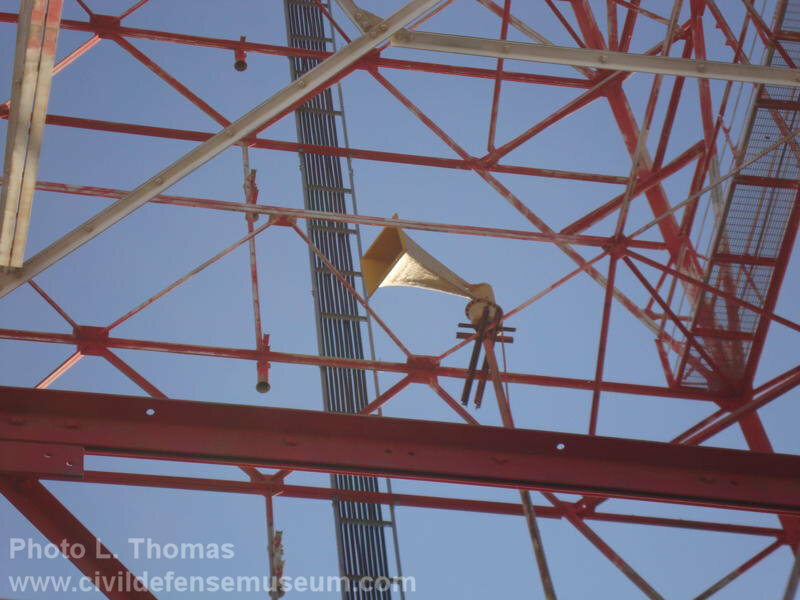 P-50 was the ACA name for the siren and when the company was reorganized to American Signal Corp. the siren was renamed T-135 for it's 135db at 100 feet sound output rating. See an ACA P-50 below located in North Richland Hills Texas.